Because museum pieces are rarely if ever sold, they are literally priceless and can only be determined by their insurance value. 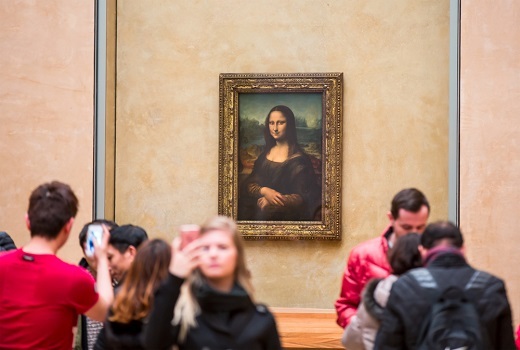 This is the situation for many of the world's most well-known masterpieces, including the 'Mona Lisa' which is said to be worth about $810 million today. On the other hand, some pieces have managed to slip between the gaps and be sold to private collectors for very large sums. Let's take a look at the world's most expensive art and see just how valuable a painting can be. The value of art seems to be increasing all the time, with the top ten prices paid at auction all taking place over the last ten years. In order to come up with the following list, the price of each painting was adjusted for consumer price index inflation and converted to United States currency using the exchange rate at the time of sale. The most expensive piece is 'Salvator Mundi' attributed to Leonardo da Vinci, sold at auction in 2017 for $450 million to the Abu Dhabi Department of Culture and Tourism. 'Salvator Mundi' smashed auction records when it sold at Christie's New York in late 2017, thanks mostly to its rarity as one of less than 20 authenticated da Vinci paintings in existence. While this work will probably end up on display at the new Louvre Abu Dhabi, its anticipated unveiling has been delayed from its original date of September 2018. The general public are likely to first see this work at the Louvre in Paris, which is due to show the painting next year. While the da Vinci painting was created circa 1500, the world's second most expensive painting is from a much later period in 1955. 'Interchange' by Willem de Kooning sold in 2015 for $310 million, followed by 'The Card Players' by Paul Cezanne for $272 million in 2011, and 'Nafea Faa Ipoipo' by Paul Gauguin for $210 million in 2014. Other than 'Salvator Mundi', all of the paintings in the top ten are from the 20th or late 19th century, including works by Jackson Pollock, Gustav Klimt, and Pablo Picasso. Many of the world's most famous paintings, especially those created by old masters from the 18th century or earlier, are held on permanent displays in museums. As mentioned, the 'Mona Lisa', again by Leonardo da Vinci, may be the most valuable painting in the world when measured according to insurance value. Other incredibly valuable but impossible to buy paintings include 'Les Demoiselles' by Picasso, 'The Starry Night' by Vincent Van Gogh, and 'A Sunday Afternoon on La Grande Jatte' by Georges Seurat.